I'm casting my mind back to last spring for the final post about our trip to Peru, when we travelled from Lima to Lake Titicaca, Puno, Cusco, Machu Picchu, the Sacred Valley, Puerto Maldonado, and back to Lima. It was - like all our long-haul trips - a jam-packed itinerary with lots of 6am starts, hotels and internal flights. Our penultimate stop was two days in the Peruvian Amazon, which was unlike anything I'd experienced before: spotting wild animals, sleeping in a rustic wooden lodge in the jungle, hiking through the humid rainforest and being bitten alive by mosquitoes. It was a fantastic, unique experience (apart from the bites), but I was also glad to return to city life... For our last three days, we continued exploring the capital, staying in the colourful, coastal district of Miraflores. The food scene in Peru is off the scale. Thanks to its diverse climate and geography, everything grows there, and we ate so many incredible things - from potatoes dipped in clay from a llama farmer in the Altiplano to tasting menus at one of the world's 50 best restaurants. After landing back in Lima, we headed to the hotel, showered, dressed up in something which wasn't mozzie spray-drenched hiking gear, and went out for pisco sours before an excellent dinner at Rafael. The next day, we hired bikes - my favourite way to discover new places (my favourite mode of transport full stop) - from the friendly dudes at Lima Bike Rental for a morning of exploring, stopping by the pre-Incan pyramid Huaca Pucllana and for seafood at La Rosa Náutica on the pier, and an afternoon cruising the coastline and the charming streets of the artsy Barranco district, including Peru's very own Bridge of Sighs, the Park of Love with its landscaped gardens, colourful mosaic tiles and Victor Delfin's kissing sculpture, and pottered around the cliffside Larcomar before sunset drinks. 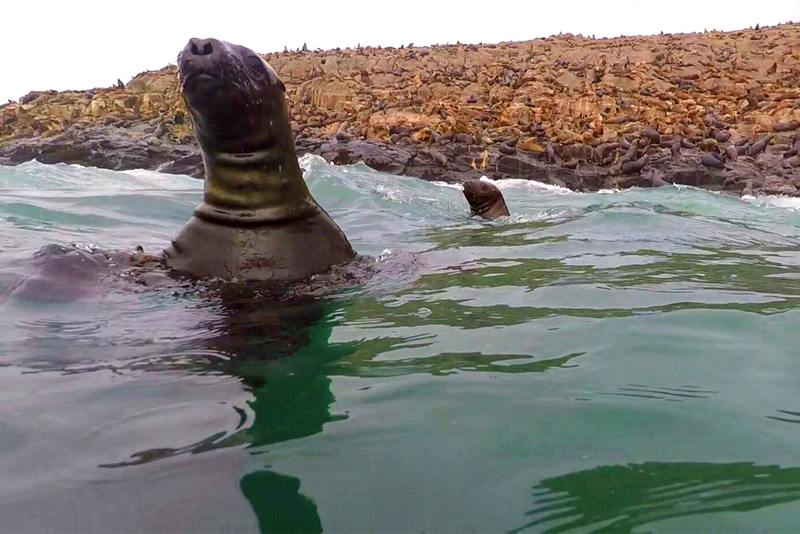 On our second day, we hopped in an Uber to the Callao port and got on a small boat for the rather turbulent voyage to the Palomino Islands, to spot Humboldt penguins and snorkel with playful, noisy sea lions. I'd never had sea sickness before - other than one nauseous afternoon docked for lunch in the Solent whilst doing my Competent Crew course, which was so mild I thought I was pretty much immune - but ooh let me tell me you, I am not. I didn't feel too bad on the outbound trip - certainly better than the poor girl being sick, and the other poor girl who spent the next four hours in the foetal position - but after swimming in the cold water and getting back onto the boat, shivering and slowly bobbing through massive waves back to shore, I felt pretty horrendous. It was still an ace experience and I'd do it again, but with lots of motion sickness medication. On our last day, we went back to see more of the historical centre and its eclectic mix of architecture, from the beautiful baroque Torre Tagle Palace to the grand Basilica Cathedral, San Francisco church and the Government Palace, complete with ceremonial marching band and hundreds of encircling birds. Visitors often only briefly stay in Lima en route to Machu Picchu or on a whistle-stop tour of South America, but I'd recommend staying for a couple of days as there's plenty to see, plenty to do and plenty to eat. Te veo pronto, Péru!